Facing stiff opposition from allies, President Bush said Thursday that world leaders "must not back down" from Saddam Hussein and demanded quick action to disarm Iraq. Speaking a day after Secretary of State Colin Powell's address to the U.N. Security Council, Mr. Bush said he would be open to a second U.N. resolution on Iraq, but only if it led to prompt disarmament. "The Security Council must not back down when those demands are defied and mocked by a dictator," he said. If the U.N. fails to act, "The United States, along with a growing coalition of nations, is resolved to take whatever action is necessary to defend ourselves and disarm the Iraqi regime." Mr. Bush said the Iraqi leader was given a "final chance" to comply with the U.N., but that he "is throwing that chance away." He also accused Saddam of authorizing Iraqi field commanders to use chemical weapons in the event of war. CBS News Chief White House Correspondent John Roberts reports the resolution the president is seeking is a very basic one – no deadlines, no fancy language – that would simply state that Iraq has failed to comply with U.N. demands to disarm; and that would trigger the "serious consequences" contained in the first resolution passed last November, which in turn will mean war. The U.S. will likely introduce a resolution soon after the U.N. weapons inspectors' next report to the Security Council on Feb. 14. Before then, the White House fully expects Saddam to make another play for time by showing more cooperation with weapons inspectors. "No doubt he will play a last-minute game of deception," said Mr. Bush. But, he warned, "the game is over." In addition to Thursday's green light for the first private interview with an Iraqi scientist, officials believe he may also relent on flights of U-2 spy aircraft and perhaps even divulge some weapons he has so far denied having. Iraq's ambasssador at the United Nations, Mohammedal-Daouri, said of Mr. Bush's remarks: "It sounds like he wants a resolution for war." Sticking largely to the case outlined by Powell on Wednesday, the president said there is no doubt Saddam is not complying with the earlier U.N. order to disarm. "Saddam Hussein recently authorized Iraqi field commanders to use chemical weapons, the very weapons the dictator tells the world he does not have," he said. "Saddam Hussein has the motive and the means and the recklessness and the hatred to threaten the American people. Saddam Hussein has to be stopped," Mr. Bush said. 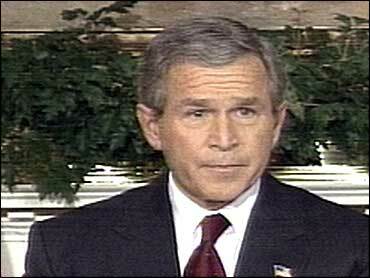 He suggested anew that there is a link between Saddam and the terrorist group al Qaeda. "The same terrorist network operating out of Iraq is responsible for the murder — the recent murder — of an American diplomat, Lawrence Foley," Mr. Bush said. Foley, a U.S. Agency for International Development official, was killed last November outside his home in Amman, Jordan. Foreign ministers responded mostly with calls for more weapons inspections after Powell's U.N. presentation, in which he asserted that Iraq was shifting and hiding weapons and missile programs from the current inspectors. Powell told the Senate Foreign Relations Committee that most of the statements read by foreign ministers after his speech had been prepared beforehand. He said he detected a shift in attitude when he talked to 13 of the ministers in private afterward. He said the Iraqi situation would be brought to a conclusion "one way or another" in a matter of weeks. Still, President Jacques Chirac said Thursday France's position on war with Iraq was unchanged. "We refuse to think that war is inevitable," Chirac said. In Baghdad, an Iraqi scientist submitted to a private interview with weapons monitors for the first time, meeting a key international requirement. A senior U.N. official later confirmed an interview had taken place and that it lasted at least three hours. The interview was the first time a scientist linked to Iraq's weapons programs has spoken to inspectors without Iraqi officials present. Such interviews have been a top demand of U.N. inspectors, hoping the scientists will reveal clandestine weapons programs. Hours earlier, top U.N. nuclear inspector Mohamed ElBaradei demanded Baghdad show greater cooperation, as he and fellow chief inspector Hans Blix briefed British Prime Minister Tony Blair on their way to Baghdad for talks this weekend. "They need to show drastic change in terms of cooperation," ElBaradei said. "Our mission in Baghdad this weekend is crucial. We hope we will secure full, 100 percent cooperation on the part of Iraq." Blix and ElBaradei are to present their latest report to the U.N. Security Council on Feb. 14. Secretary Powell said Thursday that their visit to Baghdad would be key to seeing if Iraq intends to cooperate. Turkey's parliament voted to allow the United States to begin renovating military bases and ports, a first step toward opening the way for U.S. combat troops. The vote came after Prime Minister Abdullah Gul said Turkey had no choice but to back Washington in an Iraq war. Belgium asked the European Union to call an emergency meeting to discuss a peaceful way out of the crisis. Foreign Minister Louis Michel also said Belgium is opposed to letting NATO start planning its role in any possible war on Iraq. After talks with British officials, Iran's foreign minister called for a second U.N. resolution to help resolve the crisis through diplomacy.